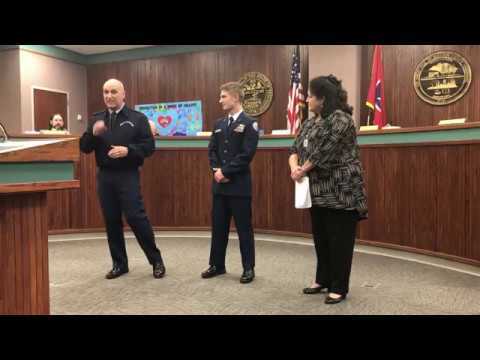 KINGSPORT — Sullivan South High School senior Jacob Smith is bound for the University of Tennessee, Knoxville, and then plans to join the Air Force. Before that, however, he’ll be earning his private pilot’s license. He’s got one of 150 slots nationwide in an Air Force Junior Reserve Officers Training Corps Chief of Staff Flight Academy. It comes with a $20,000 college scholarship, which he hopes to use at UT in addition to a possible ROTC scholarship. Smith applied for the program last year but did not make it. Smith doesn’t yet know where he will attend the flight program, but he’s put in a preference for Liberty University. He’s already been accepted to UT and in the fall plans to start studies toward a degree in aerospace engineering. “As of right now, I intend to go (into the Air Force) after college,” he said. However, the summer program, which seeks to increase the pool of available military and civilian pilots, does not require that. “There’s a huge shortage (of pilots),” said Smith, who has been in the South AFJROTC for three and a half years. He said that once he tried AFJROTC at South, he was hooked. “It opened a lot of doors for me,” said Smith, who also participates in a dual enrollment aviation course through South and Northeast State Community College. Retired Air Force Master Sgt. Don Shawver, South’s aerospace instructor, and retired Air Force Lt. Col. Lyndon “Lindy” Williams, senior aerospace instructor, said Smith has worked hard during his time at South. Smith has been on the cross country team for four years, and he played on the freshman football team. His parents are Shanan and Michael Smith, and his brother, Caleb, is a sophomore at South. Smith has also been taking Advanced Placement English this year, which will mean college credit at UT if he does well enough on the AP test.